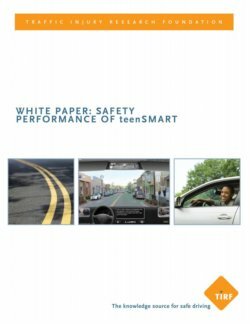 The Traffic Injury Research Foundation (TIRF) conducted an independent review of teenSMART, a product of ADEPT Driver. The purpose of this review was to assess the veracity and strength of the available evidence that this training program reduced teen driver crashes, which is a stated objective and claim of the program. teenSMART is a driver education training program that consists of computer-based driving tutorials; parent-teen activities including in-car driving sessions; and, a certification test at the end of the program. This paper summarizes the literature on the safety effectiveness of beginner driver education and post-licensing training programs for new drivers to provide context to discuss the safety performance of teenSMART. This critical review supported the claim that teen drivers who completed teenSMART had lower collision rates than those who did not. In particular, this product has undergone review and assessment by insurance companies over the past 16 years that attest to its safety benefits. This paper also considers the potential cost-benefits of teenSMART as a safety initiative to reduce teen driver crashes, however, caution should be taken in interpreting the results of this cost-benefit analysis.